(Newser) – No one could accuse the Brits of a lack of passion for their history. As the feud continues over where to bury Richard III, the head of the York Minster church is getting hate mail, AFP reports. Nine of Richard's descendants have called for his reburial at York, where he had royal ties. But the UK has left the matter in the University of Leicester's hands; the school says he'll be placed in Leicester Cathedral. Re: the photo with the article. At first glance....I thought it was the evil Lord Farquaard from Shrek!!! 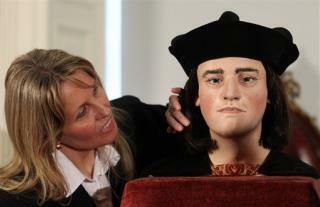 By golly..its an actual reconstruction of the real King?? Compare for yourself! http://tinyurl.com/av6axug Oopsie...my bad.